PokerBRB is all about having fun competing against each other in poker freerolls. We believe these freerolls could be even more fun if different forums were compete against each other. 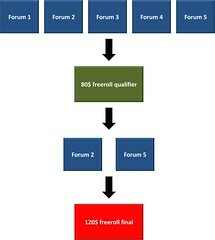 We have therefore teamed up with Poker Nordica to be able to host a forum freeroll stand off. A fun and free poker tournament competition where your forum members will be competing against other forums. Your revenue share will be 30% up to 5000$, 35% from 5000-10001$ and 40% for anything above. Send us three different options for the bonus code (e.g. POKERBRB200)) you want to offer your members. The bonus code will ensure that your members get the right sign up deal and get associated with your account. Send us your affiliation details (username and registered email) and we will make sure you get bumped up to the better than average affiliation deal and get your affiliation link and bonus codes. Prior to the qualifier, each forum webmaster sends us a list of their top 10 poker talents (of course more people can join from each forum…we have limited the list to 10 players to keep the scoring as simple as possible). We will score each participant in the qualifier using the PokerBRB point system and then sum up which two forums have made the most points based on the positions their chosen 10 players achieved. The two forums with the most points each choose 10 players to represent their respective forum in the final and provide us with a list of the player’s usernames at Poker Nordica. We will leave it up to the individual forum webmasters to set-up criteria for selecting the 10 finalists. Each of the 20 players will receive a coupon to enter the final. The winner of the final will receive 30$ paid into his/her Poker Nordica account and his/her forum will be crowned the overall forum champion. Each of the remaining players on the winning team will receive 10$ paid into their Poker Nordica account. The PokerBRB freeroll league forum will participate with our own team in the qualifier and we have set a maximum of 5 participating forums for our first competition, so if you’re interested please let us know at support@pokerbrb.com as soon as possible so we can start planning. We already have one participating forum namely Clubcaptain.